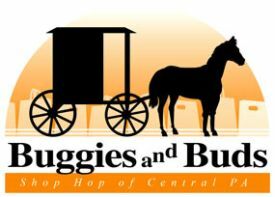 The Buggies and Buds Passports are $18.00 each, with the purchase of a passport you will receive a 20% off discount at all shop hop stores during the event and a gift. This year on our web-site we are adding the shipping to the passport they will all be mailed for 2.00 more. This makes them $20.00 with the shipping included. If you would like to pick up and save the $2.00. Please click on the remove shipping postage stamp. If you are buying more the one please add the other persons name in the comments. If you are picking up multiplies please remember to remove the shipping for each. Passports will be available for pick up late summer or during the event. Event runs September 27th- October 7th.